Interactive sound garden for Little Bridge Children’s Hospice ,Barnstaple North Devon. This adds an immersive sound element to the garden themed around the C.S. Lewis novel the Lion , the Witch and the Wardrobe. Interactive sound garden for Little Bridge Children’s Hospice, Barnstaple North Devon. This adds an immersive sound element to the garden themed around the C.S. Lewis novel the Lion, the Witch and the Wardrobe. This follows a line of research around placement of sound systems within outdoor settings. This creates an augmented experience where the sounds are set within the natural or cultivated external environment. This has been both a technical enquiry developing novel systems and also into the creation of extended fields of sound within the landscape. This initially became possible when the first modular digital sound units became available in the early 90’s. The use of digital sound marked a distinct contrast to the development of novel acoustic / electronic instruments and systems which I had been developing throughout the 80’s. Solar stream commissioned for the garden festival Wales in 92 linked an EPROM based sound unit programmed with an audio sample with a solar panel which directly powered it. A series of audio samples taken from a stream in the Brecon Becons where distributed in solar sound post along a pathway within the festival. Visitors experienced the spatial sensation of walking along a stream energised and modulated by the sun. The addition of a movement sensor and storage battery introduced the potential of an interactive element. This was first tested at “ Ha Ha “ contemporary British Art in C18th Park, a group exhibition including Anthony Gormley, Cornelia Parker, and Grenville Davey. These Interactive solar sound boxes then formed part of the “ State of Sea “ installation at the Tate St Ives. 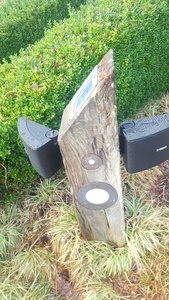 A later version commissioned for Diana Princes of Wales memorial garden set the interactive solar system into sculptural posts fabricated from Jara wood and brass and produced the sound of gentle lapping waves as visitors moved between them. 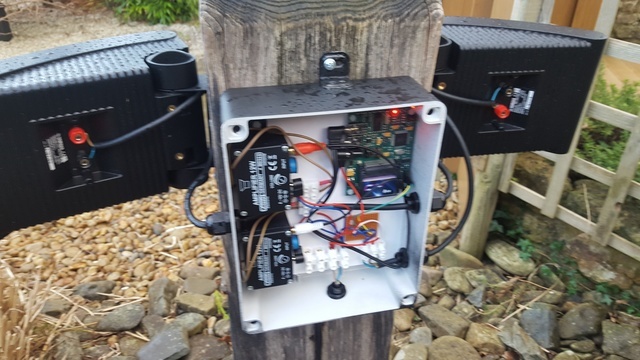 In a more functional and applied context the interactive solar sound system I had developed was used as an audio information system throughout the “ Earth Centre “ an ecological theme park established in an industrial wasteland of Yorkshire in late 90’s. The development of the Solar Sound Box series as exploited emergent digital modular sound technologies from eproms to more recently MP3 format but always seeking to use the most efficient energy configurations allowing the system to be solar powered and then potentially placed within the remote landscape. “ Whispers in Kanji wood “ set in a forest canopy in South Wales was the first installation to use a solar powered MP3 system and the extended sample time available allowed an extensive and complex sonic narrative and ambience to be explored within this natural setting. 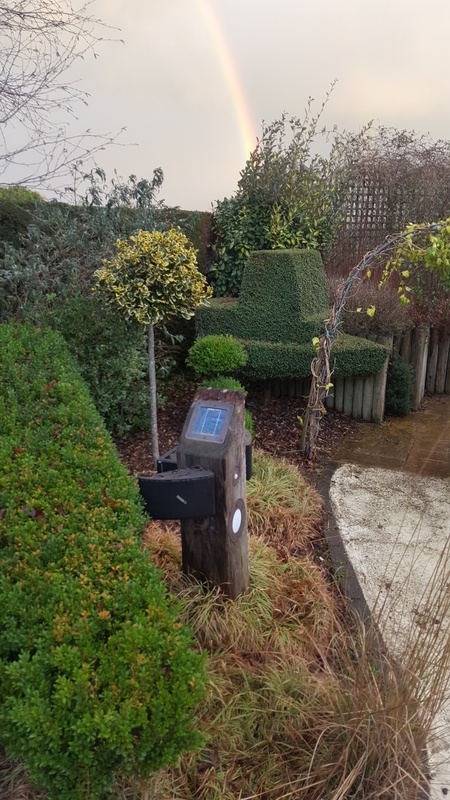 Most recently this interactive mp3 system has been set within themed multi sensory gardens at children’s Hospices in Cornwall and Devon allowing the children and visitors to immerse themselves within these fantasy environments.